Vexcel Imaging has released a new docking station. While offering the same performance as its predecessor, the new Docking Station v3 SATA is lighter, smaller and quieter than the previous version. For easier transportation in the field, it is now equipped with a comfortable handle. The design is inspired by the revised UltraCam sensor system and now also includes an illuminated power switch clearly indicating power on or off state. 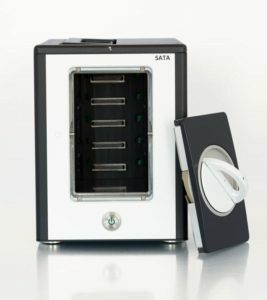 The Docking Station v3 SATA is already available and will be shipped along with any new UltraCam aerial sensor system.